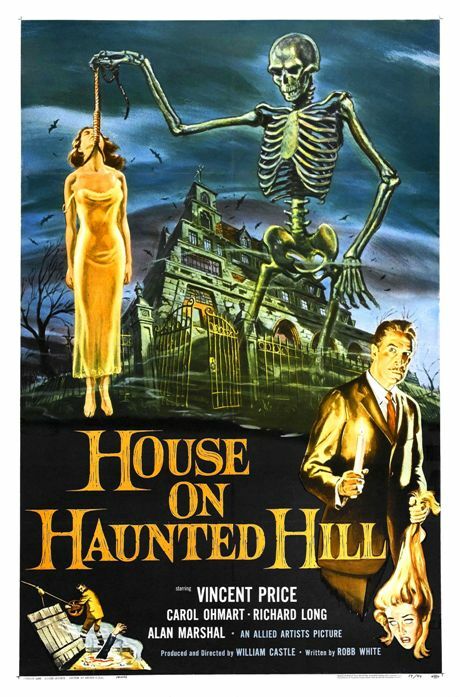 HOUSE ON HAUNTED HILL (1959): Showmanship Meets Craftsmanship In The Horror House – Schlockmania! Much to-do is made by genre scholars of William Castle’s gift for ballyhoo: discussions of his films often revolve around the elaborate promotional gimmicks he dreamt up to accompany each film. 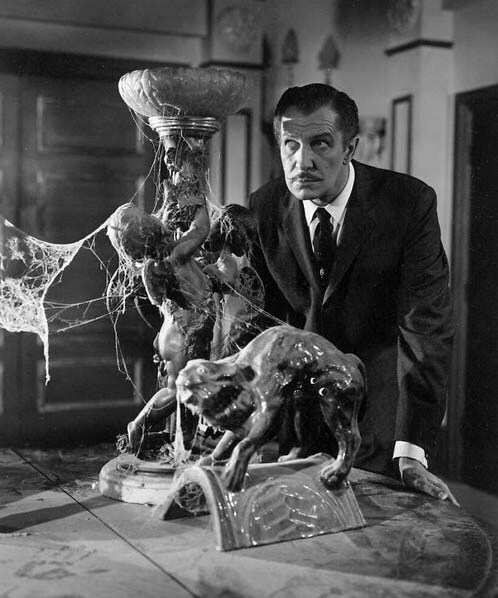 Case in point: House On Haunted Hill boasted a gimmick called “Emergo” in which a skeleton on a string would float over the heads of viewers at a key point in the film. Showmanship liked this helped Castle earn both profit and notoriety and it is an important part of his legend. However, it is also important to remember that Castle made a number of interesting, well-crafted pop horror films to back up his gimmicks. Again, House On Haunted Hill is a perfect example. Even when stripped of “Emergo,” this a taut, engaging little chiller that can be enjoyed by anyone who likes a little fun in their horror films. House On Haunted Hill‘s premise cleverly grafts the structure of a drawing room mystery onto a time-honored horror film setting, the haunted house. Twisted millionaire Frederick Loren (Vincent Price) is an unhappy marriage with Annabelle (Carol Ohmart), whom he suspects of trying to kill him. She wants to have a party so he rents out the title location, which has a macabre history of killings and is reputed to be home to the ghosts of the people who died there. And that’s not all that Frederick has up his sleeve: he’s also invited a quintet of visitors, all in need of money and all from different walks of life. What they share in common is one thing: if they can survive a night at the haunted house, they’ll get a reward of $10,000 in the morning. Before the sun rises, the house will unleash plenty of treachery to keep everyone inside from reaching the finish line. House On Haunted Hill is a pleasure to watch because it knows exactly what it wants to be. The backbone is provided by a twisty, fast-paced script from Robb White: he wrote many of Castle’s best films and his narrative offsets its shocks with witty dialogue, including some fun battles of wits between its cast members (the best are between Price and Ohmart). Price’s lead performance is a macabre delight and he’s matched step- for-step by a subtler but no less charismatic performance by the sultry Ohmart. Horror fans will also enjoy the haunted yet witty turn from Elisha Cook Jr. as the one visitor who knows about the house’s history and reminds them at every turn. However, the element that seals the film’s success is William Castle’s direction. It is stylish in an old fashioned “studio director” sort of way, sleek but free of obtrusive flashiness as it slaloms its way through a barrage of plot twists and jump-shocks. He approaches the story the way he approached his ad campaigns: he dives in with a carny-styled “go for the throat” approach and packages it with energy and glee. The finale he crafts for the film, which incorporates a skeleton, a surprise resurrection and acid pit, is emblematic of the film itself: these are cheap thrills at their finest. Thus, House On Haunted Hill is not only necessary viewing for Castle fans but a must for viewers who want a reminder of when horror was designed to be macabre fun instead of an endurance test.